Despite almost dropping the first set, the Southern Oregon volleyball team still had enough fight left to defeat Northwest University in a three set sweep and claim the Cascade Conference title. 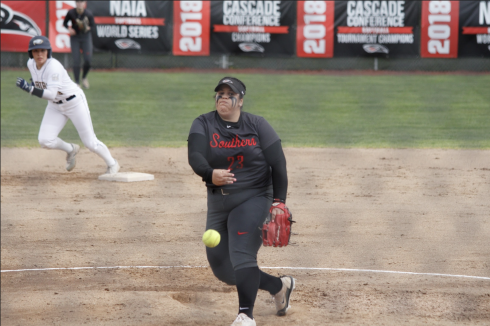 The win marked the end of the Raidersâ€™ dominating season in which they posted a 17-1 conference record and 20-3 overall to give head coach Josh Rohlfing 20 victories in each season of his four years as Southern Oregonâ€™s head coach. It also was the final regular season match for seniors Leah Bergstrom, Lindsey Stone and Leanne Stennett. All three ended the season with a well-deserved victory. In the first set, the Eagles nearly upset the Raiders by taking the lead on several occasions and nearly sealed the set with the score at 24-23. However, Southern Oregon was able to recover by relying on kills by Megan Bartling and Stennett to give the Raiders a 27-25 first set win. 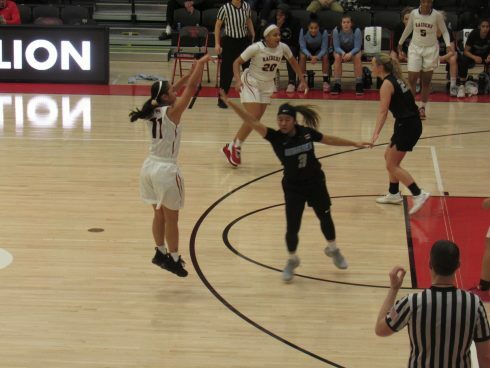 The second set was yet another tightly contested affair however Southern Oregon made sure that they managed to stay in the lead despite Northwest University drawing level several times. Outside hitter Sarah Holgen paced the Raiders offensive drive by recording seven kills in the set while the Eagles relied on Lauren Holtzâ€™s five kills to keep them in contention as the Raiders grabbed the set 25-21. Northwest University was determined to take a set away from the Raiders as the third was yet another back-and-forth battle between the teams. Following a service error by the Eaglesâ€™ Elle Ottow, the Raiders went on a three-point run to go up 12-9 and looked likely to continue. However, Northwest University responded after Breanna Coveyâ€™s kill following a serve by Stennett to go on a run of their own and take the lead at 13-12. Â From that point on, it was anyoneâ€™s game as the Raiders and the Eagles jostled for the lead. Eventually Southern Oregon was able to overcome the stubborn Northwest University side with a kill by Holgen and service ace by libero Becky Johstone to give the Raiders a 25-20 set win and the Cascade Conference title. Holgen was the team leader for the Raiders with kills at 21 and also contributed 16 digs for the night.Â Stennett also came up big with 14 kills and 15 digs and Stone recorded a match-high 49 assists while also grabbing nine digs. As champions, the Raiders will now host the conference post-season tournament this Friday and Saturday in the McNeal Pavilion. College of Idaho and Concordia will play first on Friday at 4 p.m. followed by the Raiders and Northwest at 7 p.m.Â The final will take place on Saturday at 3 p.m.